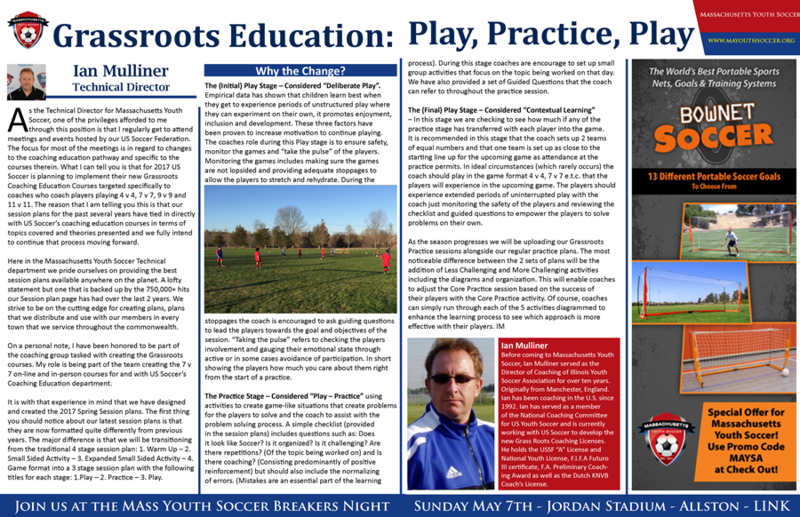 Please note, all Massachusetts Youth Soccer session plans are provided in good faith and must not be handed in as session plans for assignments on US Soccer or United Soccer Caoches coach education courses. We welcome coaches and organizations to share, use and build upon all Mass Youth Soccer Session plans as long as appropriate credit is given. Please use the Document search below to download 12U plans from previous years. Please note, all Massachusetts Youth Soccer session plans are provided in good faith and must not be utilized for assignments for US Soccer or NSCAA coach education courses. We welcome coaches and organizations to share, use and build upon all Mass Youth Soccer Session plans as long as appropriate credit is given. All children are maturing at different rates and are sensitive to that fact. Need to warm-up and stretch as muscle pulls and other nagging injuries tend to become more common. Typically understand elemental abstract concepts and hypothetical situations. They like to solve problems. Peer evaluation is a constant. Coordination may depend on whether or not they are in a growth spurt. Technique still needs to be reinforced constantly. Playing too much can lead to overuse injuries. Playing too much and not feeling like they have a choice in the matter can lead to burnout and drop-out. This is the dawn of tactics! Keep asking the players to be creative and to take risks. Ask for feedback from them. They will tell you how things are going. Try to hand over leadership and ownership of the team to them. They will enjoy leading and it will add to the learning environment. ©2019 Massachusetts Youth Soccer. All Rights Reserved.